10 May 2016, at 12:00a.m. ROMANIA - Transavia, in Romania, has a market-leading position in the domestic market in the manufacturing and sale of fresh poultry meat products. Transavia is a fully integrated poultry producer, currently providing a full range of fresh and frozen chicken meat products, as well as further processed chicken products. With production facilities located in five Transylvanian counties (Alba, Sibiu, Bra?ov, Cluj and Harghita), Transavia aims for the highest standards in every process of manufacturing and sale of their products. Petersime has been a long term partner of Transavia and is proud to be part of the expansion and renewal of their Sibiu hatchery. Transavia wanted to invest in state-of-the-art technology, which is why they have ordered new Petersime equipment. Constant investments and consolidated know-how are essential ingredients of Transavia’s success recipe. 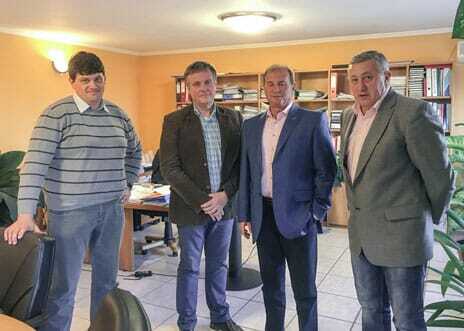 The hatchery will be fully operational by the end of summer 2016 and will then reach a yearly setting capacity of 32 million eggs thereby becoming the biggest operational hatchery in Romania. Mr Ovidiu Oprita (Technical Director Transavia); Mr Ioan Popa (General Manager Transavia); Mr Jan Pauwels (Area Sales Manager Petersime); Mr Silviu Popescu (General ManagerSipoServ – Petersime’s distributor for Romania).